Ben Middleton, Negotiations Officer at Prospect, explains what the spending review might mean for Ordnance Survey. This reaction was first published on Prospect website. Buried in the middle of the Government’s Spending Review and Autumn Statement 2015 are proposals which could jeopardise the future public ownership of Ordnance Survey. The Government is seeking to realise up to £5 billion in corporate asset sales by March 2020, including looking to ‘develop options to bring private capital into the Ordnance Survey before 2020’ (page 74). Coming so soon after the transition to a Government-owned Company (GovCo) in April 2015 this announcement is a cause for concern. Clear assurances were given that becoming a GovCo will not change the ownership of Ordnance Survey and that it will remain 100% in public ownership. Prospect is not anti ‘private sector’, and conceivably private investment into Ordnance Survey could be a positive move if undertaken in a form compatible with the existing GovCo strategy of further partnering arrangements to enable the organisation to develop into new markets and develop new products and services. We want Ordnance Survey to continue to be a successful organisation but we are also quite clear that we want to see Ordnance Survey continue as a 100% publicly-owned body fulfilling its’ public task as the National Mapping Agency. Investment in the form of equity share or partial sell-off, where profit would increasingly come before public service, would be contrary to that policy position. We are unlikely to be persuaded that maintaining a majority ownership or ‘golden share’ provides any meaningful assurance that wholesale privatisation would not be the eventual outcome. One only has to look at what has happened previously in similar situations – British Airports Authority or more recently Royal Mail, to see that such assurances are effectively meaningless in the longer term and further proof is the Chancellor’s statement proposing exploring options to sell-off the remaining 49% stake in National Air Traffic Services (NATS), previously protected by so-called ‘golden share’ assurances. Privatisation, whether whole or in part, would raise doubts over the long-term viability of important aspects of the organisation’s activities and see increased risk that the cost of vital services to local and national government would rise and/or the quality and currency of data decrease. Rural area mapping might be considered of little economic value but such activities are vital in the context of emergency relief –think of the foot and mouth outbreak or emergency flood relief for example. 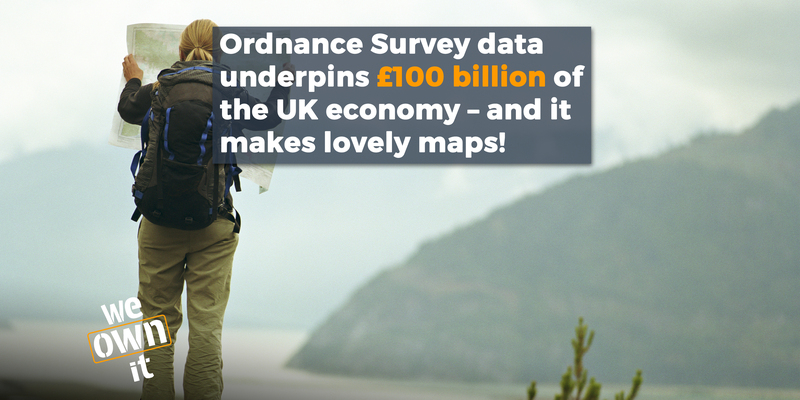 Ordnance Survey holds a position of national strategic importance and we must ensure it continues to do so and public ownership is key to that. We have a good working relationship with Ordnance Survey and expect that to continue. It is clear that further consultation is required to understand precisely what is envisaged by the Chancellor’s statement. We will be seeking meeting with Ordnance Survey, the Government, and the Shareholder Executive, to establish meaningful consultation takes place on any proposals. Branch officials have also been developing links with the campaigning organisation ‘We Own It’ as part of their ‘Top Trumps’ campaign and we will continue to work closely with them and other relevant organisations in seeking to ensure that Ordnance Survey continues to be held in public ownership for the public good. Image used under Creative Commons licensing, thanks to Simon Greig. Past privatizations of government owned bodies were made at share prices set at approximately half the true value of their assets. This was done ensure a 'successful' sale. These bodies were established by general taxation of the British people, therefore these bodies belonged to all the British people. However when privatization took place only the richer section of our society with cash to spare were able to partake in their sale and effectively double the value of their investment, thus making the better off even better off to the detriment to the poorer people in our society. One wonders at the motives of such policies from a government that professes to be working to bridge the gap between rich and poor in our society. Any successful business company knows the value of holding on to those assets that produce a steady income for it. This government seems determined to sell the geese that lay it's golden eggs just for a short term gain.